This week saw the Prep U11s take to the field for a different kind of challenge. 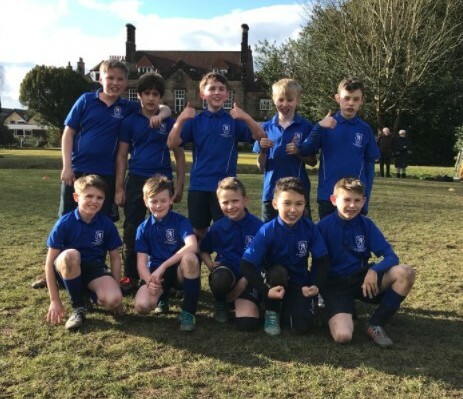 With only a brief introduction in lessons for the majority of players, Bridgewater took on Pownall Hall in a rugby union match. With only Matthew and Owen having played and trained for teams outside of school it was going to be a real test for the youngsters. The task was made all the more difficult as the opposition had been playing together for over two years already. Consequently, it was no surprise to see the hosts go into an early lead, as Bridgewater got to grips with the rules and aggression of the game. Despite some resolute and brave defending from the team, as the half wore on the more experienced team took advantage of the gaps appearing as the weariness of constantly tackling opponents took its toll. Ethan carried the fight to Pownall with driving runs out wide, whilst Kynan and Dante tried to surge through the heart of the Cheshire side’s defence. Archie was resilient and strong in the tackle for Bridgewater, whilst Lewis was showing incredible technique and heart as he made big hit after big hit. There were many excellent performances on the day, but Lewis took the player of the match award for his outstanding defensive play throughout the game. With Pownall Hall up by 6 tries as half time approached, Bridgewater made an important break through with the last foray of the half. A sweeping move from left to right, ended with Oliver being foiled just before the try- line, but an alert Owen showed his scrum half skills by scooping up the ball and diving over the line for a moral boosting first score for the visitors. Although trailing 6-1 at half time, the team was learning fast individually and collectively. With the confidence of their first try and knowing they could take and make the tackles, Bridgewater produced a second half to be proud of. The ball went from end to end as both sides drove forwards, exchanging tries at regular intervals. In fact by the end of the game it was the hosts who were hanging on for victory, which is a massive compliment to the debutantes from Bridgewater. The final score was 13-7 to the hosts, but in the second half the game actually finished 6-6. Owen added a second try to his tally, Dante scored two and but for some desperate tackles near the line, may well of scored more. Kynan scored one and was a constant threat in the centre of the pitch. Archie dived over the line determinedly to score his first try, Lewis had one controversially disallowed for a foot out of play, whilst Matthew C, Daniel and Oliver all had big moments in attack and defence. The final word of a pulsating contest went to Bridgewater, as Matthew H picked up the ball deep in his own half to fly down the wing for the last and possibly the most spectacular try of the match. All in all, it was a great experience and a proud afternoon for the boys. It would have been easy to hide and duck out of tackles, but nobody did that. The team quickly adapted to the offside rules and no playing the ball on the floor. It is fair to say that the first experience of contact rugby was a positive one and the team can hopefully look forward to more games in the future.